This is great and very helpful! This will be very helpful to us….thnx…. Hi I m a level 1 candidate . I have failed once.in the test bank my scores are not reaching above 70 -73.I tried hard to get over 80 % but I m stuck at one point.that is 70%-73%.how to increase it now. Could anyone help me out to solve the issue. Any trick fr this. @Madhu: I would suggest to screen your own scoring pattern. Just check where you are lacking. When you get around 70-73 marks, make a pie chart on a weekly basis for respective sections. If your pie chart depicts you are good at FSA, but not that good in, say, Economics/Quant. You need to work harder and smarter on Economics/Quant relatively. Going this way, you may witness a gradual improvement in the weaker areas. 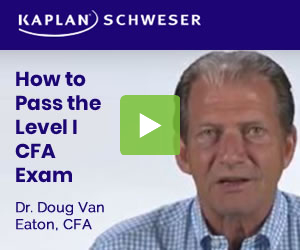 How’s your experience with Kaplan Schweser, am too planning for this december level 1 cfa but am kind of confused between buying schweser or elan notes, any thoughts? I am currently using Schweser notes and videos … they are a great source of learning the material. I am going to go over all the Schweser notes first and then go over the CFAI books. According to what i heard. Schweser notes should suffice, but i would’nt put all my eggs in basket. i am from a non-finance background and preparing for cfa level 1 december exam this year. i am using schweser notes. All i want to know is are they sufficient bcoz i don’t think so i will have the time to study the cfai boks. I am from non-finance background and would like to kick off my preparation for CFA Level1 in dec’13. But i am in state dilemma as i am not sure which one provides better study material for CFA level 1, is it Schweser or CFAI notes ? Please help me so that i can start as early as possible. thanks. I’ve had experience with both Schweser and Elan. I prefer Schweser. Elan was always late delivering their material. They overpromised and underdelivered. For June 2013 Elans mock exam for level 2 wasn’t available until 7 days prior to the exam. It was not good. I didn’t even use the mock because it was available so late. i was reading the quant section and it seems there are lot of formulae. Not sure how to remember all these formulae in the exam. does it matter in what order I study the material? should I follow the order set out my the CFA or is there a suggested one? any major changes in Schweser books compared to DEc 2014? Should i buy new ones? Just starting my study fr L1 with Alternative investments… Has Alt investments portion changed compared to 2014? Who are you studying with? There are no FACTS, only INTERPRETATIONS..
I’ll be sure to tag to the reavent topic next time… but most importantly, I’ll be sure to browse topics relavent to where I’m at in my studies. This feature will help people help others, and learn while they do it more efficiently. Love it! It’s a very useful feature. Looking to connect with someone appearing for CFA Level 1 exam this December. We are coming up with a detailed study plan and complete planning and would like to start with 1-2 students for December exam. Plz provide your email id. I will connect with you.